This beautifully decorated two-bedroom apartment in Barcelona, located in the Raval area of the city centre, considered one of the most up-and-coming and trendy areas of Barcelona is the ideal base for your trip. Moreover, the proximity to the majority of the main sights of the city and Las Ramblas make this an ideal location! The living room has a distinctly Mediterranean feel to it, with warm colors and lovely wooden furniture. It also boasts an abundance of sunlight through the patio doors which give out on to the balcony where you can watch the world go by, or soak up the city atmosphere at any time of day or night. The sofa in the living room is not only extremely comfortable but it also converts, very conveniently, into a sofa bed. There is a completely separate bedroom in this apartment, which harbors a large double bed for your comfort and then there is an alcove just adjacent to the living room with a double bed which means that, along with the sofa bed, this apartment sleeps up to six people. The bathroom has the same modern design as the rest of the apartment and hosts a mini bathtub, shower and all the space you would need for your holiday essentials. This only adds to the homely feel of this lovely Barcelona apartment. The newly furbished kitchen is fully equipped with all that you would need to prepare a lovely home-cooked meal. Pots, pans, cutlery and all dishes are provided as well. 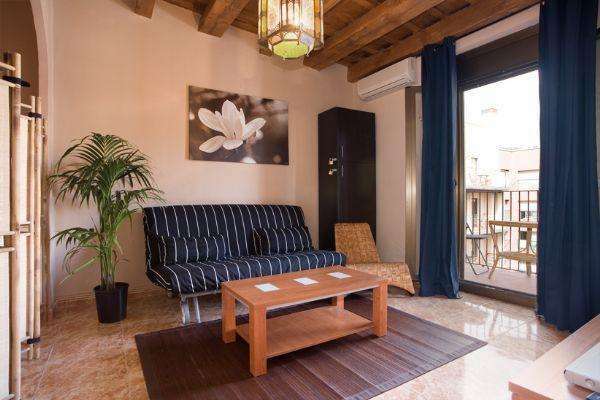 The location of this apartment is undeniably perfect as it is within walking distance from the majority of the sights which Barcelona has to offer,and just outside of the door, you will find a whole host of restaurants, bars, and shops to explore. The metro is a short walk away, ensuring that you will have access to all that this wonderful city has to offer.